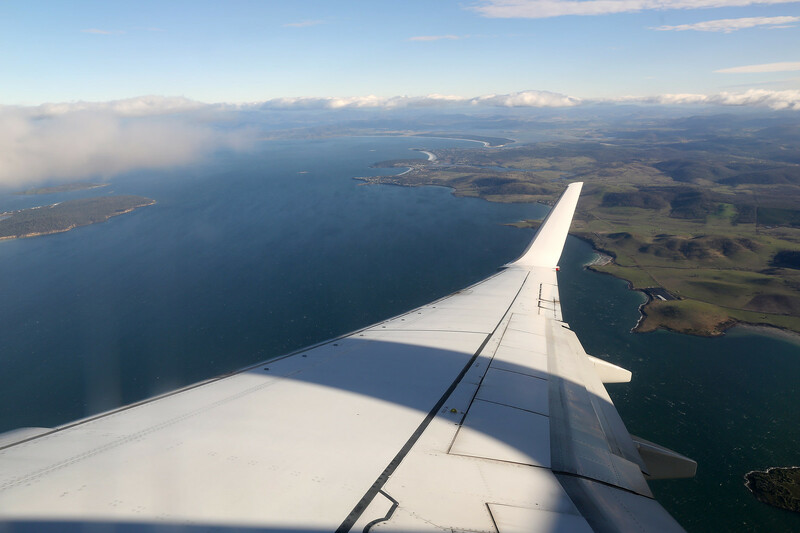 This is a relatively short trip report which I have been completing sporadically over the last few months due to a very hectic university schedule. It has been a couple of years since I last wrote one of these and feedback is appreciated. With minimal gaps in my university schedule I have had very limited flying opportunities over the last couple of years. 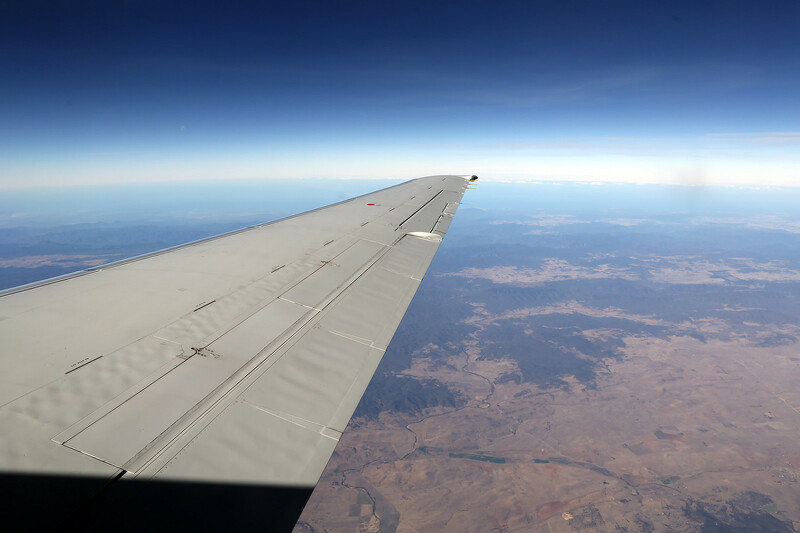 This day trip was party an excuse to fly a new aircraft (The Boeing 717) and party to try and renew my Velocity Gold membership. 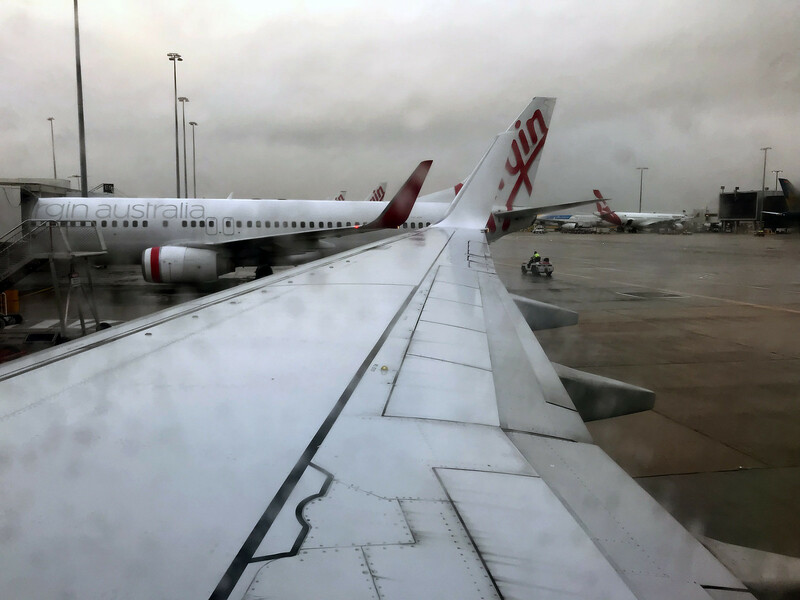 Resulting in booking Virgin Australia to Hobart via Melbourne, and returning on Qantas Link’s 717. You may ask, Why the detour via Melbourne? Well for only a few extra dollars you get an extra flight! Who doesn’t want that, and as an added bonus it also counts as another sector for frequent flyer requalification, win win! Since this was only a day trip and I didn’t want to hassle any family or friends I decided to park at the airport. Choosing the budget option of the Blue Emu car park I arrived nice and early at 5:00am. With little delay the shuttle bus came past and within minutes I was at Terminal 2. 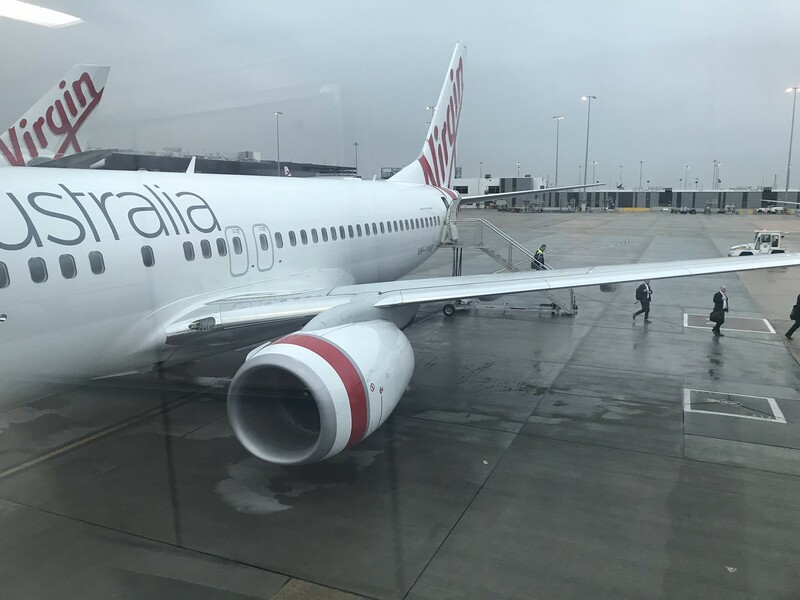 I decided to test out Virgin’s premium entry, allowing direct lounge access from the drop off area for Business class, Velocity Platinum and Velocity Gold members. Upon walking in there was a small queue for the two staff members at the counter which you could easily bypass in favour of the self service kiosk machines. Preferring the personal touch, I waited patiently for a couple of minutes in the line before being issued my real boarding passes. There are two security lanes in the premium entry allowing rapid entry into the lounge. Possibly due to the multiple times visiting the Virgin Australia Lounge I didn’t take any photos on the day, and strangely I don’t seem to have any photos storied away on my hard drive either. 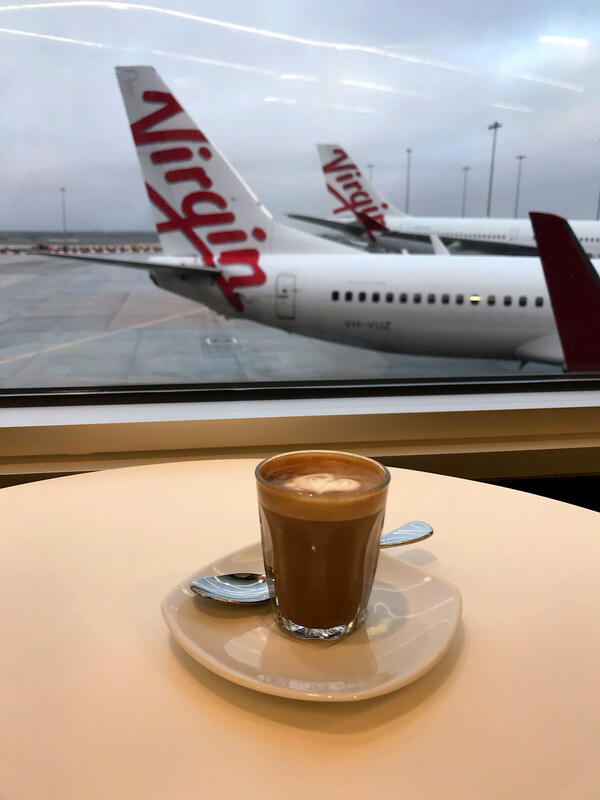 My time in the lounge was a pretty standard affair, having a simple ham and cheese toastie along with my coffee of choice, a piccolo latte. Being on one the first flights of the day, the lounge was fairly empty. Nevertheless, I commend the efforts of the two baristas behind the coffee machine, constantly pumping out coffees all morning long at a rapid pace. At about 5:30am I headed out of the lounge for the long walk down to gate 44, the very last gate on the pier. Arriving to the gate just a boarding commenced I headed down the priority lane (which was strictly enforced as always) and scanning my digital boarding pass I walked down the jet way into the awaiting aircraft. The aircraft taking me to Melbourne today was VH-YWE. 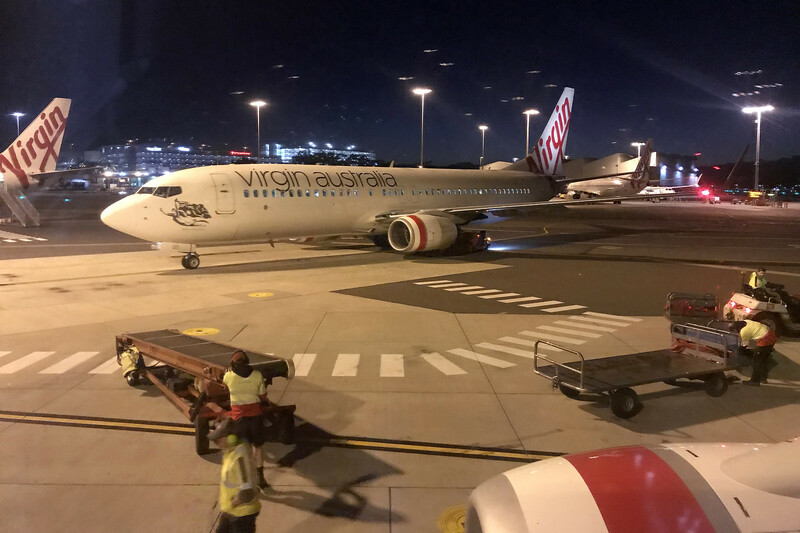 Named “Dreamtime Beach” and at only four months old, this was the newest aircraft in Virgin Australia’s fleet. 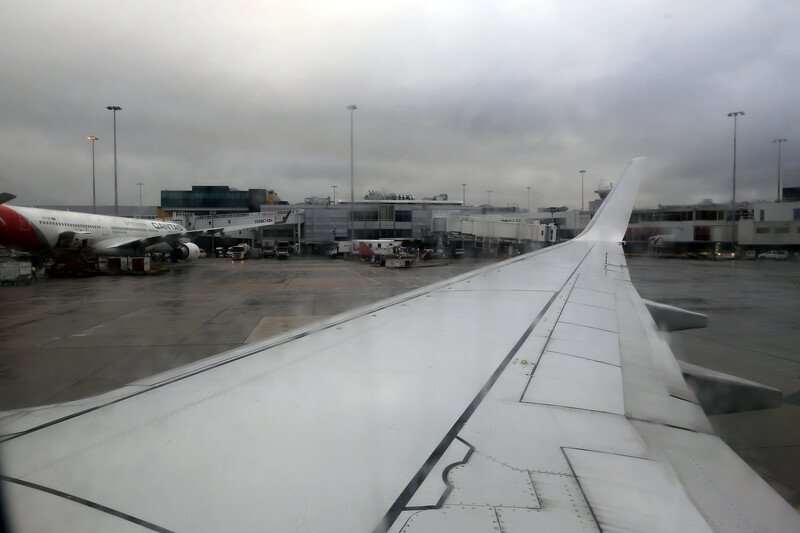 I settled into my seat, and watched the flight fill up, with the usual majority of people heading down to Melbourne for some sort of work or business related activity. Boarding completed with great efficiency, however we had to wait for the adjacent flight, VA 901 at Gate 42 to push and taxi before we could push back. 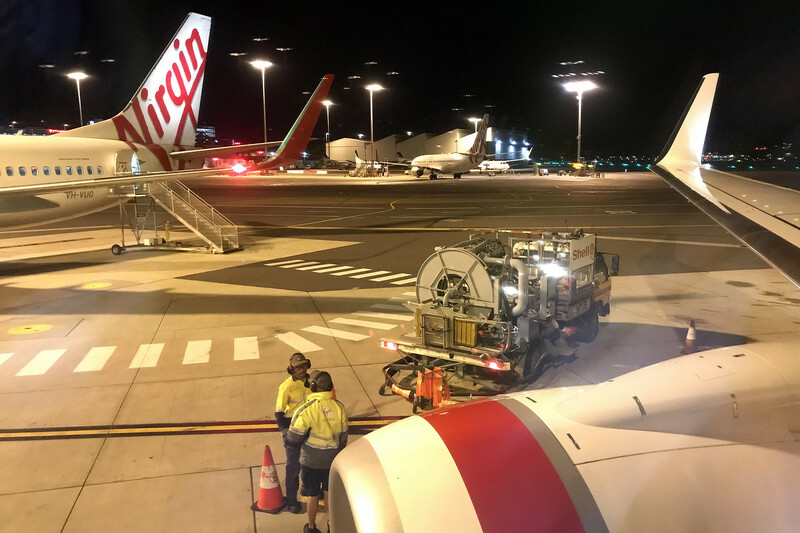 I was intrigued with the use of a remote controlled, main gear attached push back tug on VA 901. I expected a very long taxi to Runway 16L based upon the forecast, even thinking that ATC might use SODPROPS that morning. It was to my surprise when we turned right on Taxiway Bravo and headed to Runway 16R. I’ll spare everyone my atrocious attempts at getting some photos before sunrise and let the video and stills do the talking. I really love how Boeing adopted LED strobes on the newer builds of the 737. 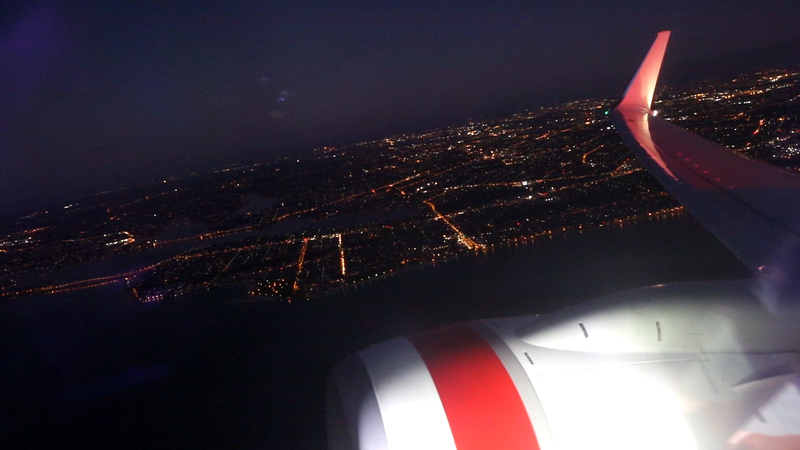 We departed south with some beautiful views of Sydney waking up. 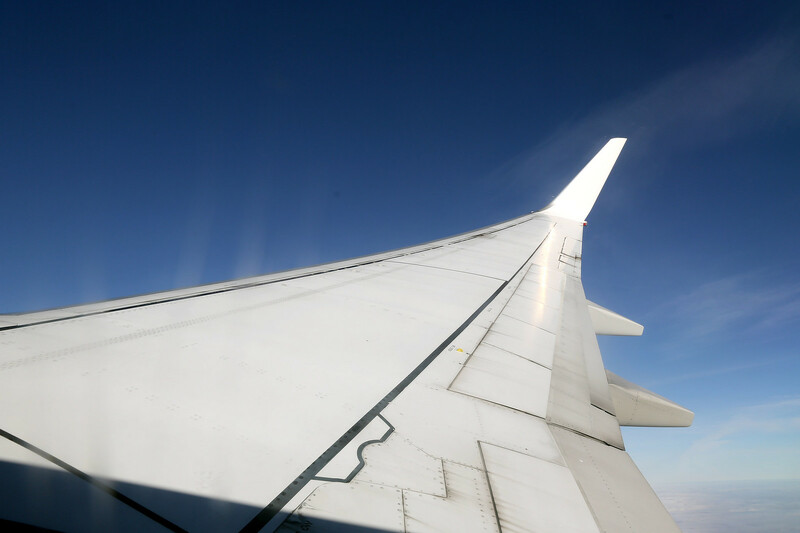 More amazing sights followed with the sun shining a glowing golden light on the CFM 56 engine. Look at the golden sunlight! 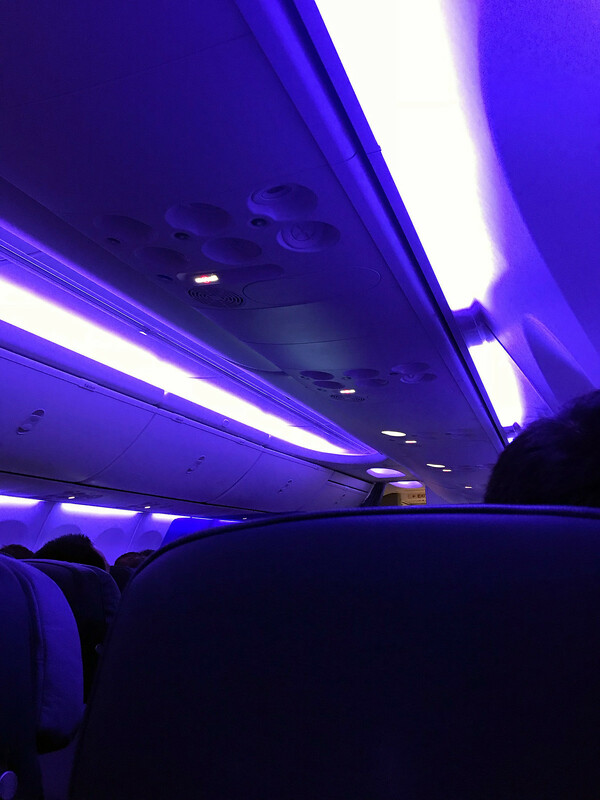 You could really tell this aircraft was brand new, with the crew firing up the purple mood lighting. The major gripe I have with Virgin is their pitiful “meal” offerings. We were served a choice of either a muesli bar or apple slices, accompanied with tea, coffee, water, or juice. A far cry from breakfast on what is supposed to be a full service carrier. I elected for the apple slices and an orange juice. While the purple light does make the orange juice look radioactive, I can assure you that it was a very normal cup of juice. 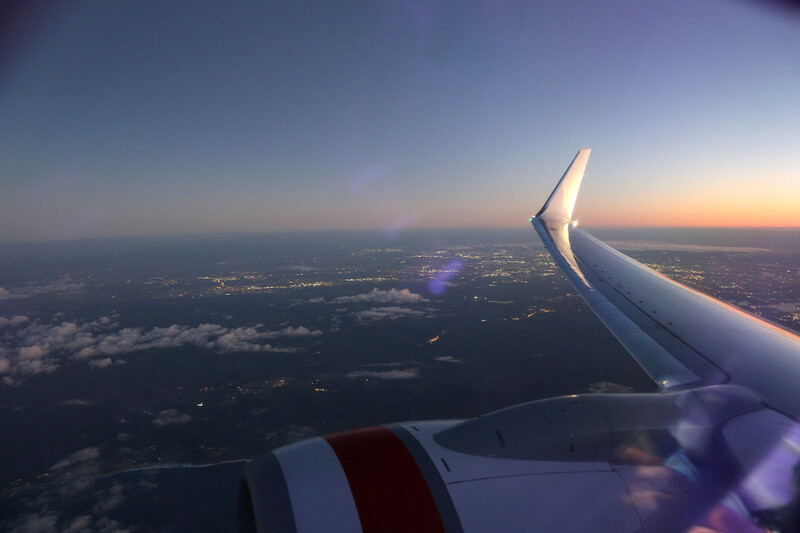 Without further ado the cabin crew came round to collect any rubbish and before long we commenced our descent into Melbourne. 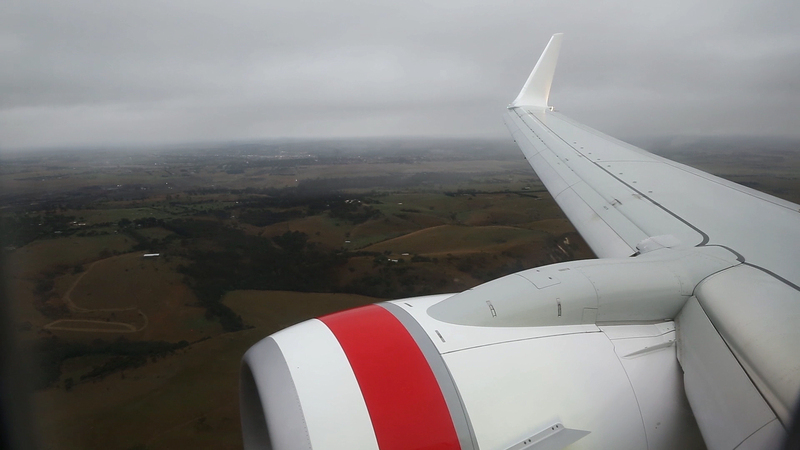 I don’t recall ever arriving or departing at Melbourne with clear skies and today was no different. 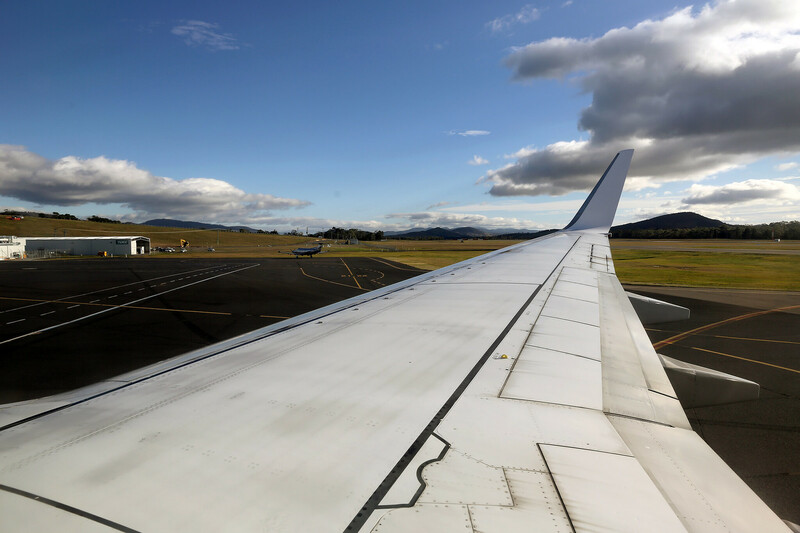 We landed on Runway 16, vacating for a short taxi to Terminal 3, parking at Gate 6. Being seated in row 8 has the great perk of being able to disembark fairly quickly. With about half an hour to spare before the published boarding time on my subsequent flight I made a bee line for the Virgin Australia Lounge. Annoyingly the lounge in Melbourne is located landside, due to the layout of Terminal 3. This unusual feature will be history soon, with a redevelopment of the terminal being scheduled in the near future. Upon entering the lounge, I found a nice spot in a big armchair right next to window overlooking the busy apron. Views in the lounge are personally an essential component for a good lounge, and this is where Melbourne’s lounge excels. 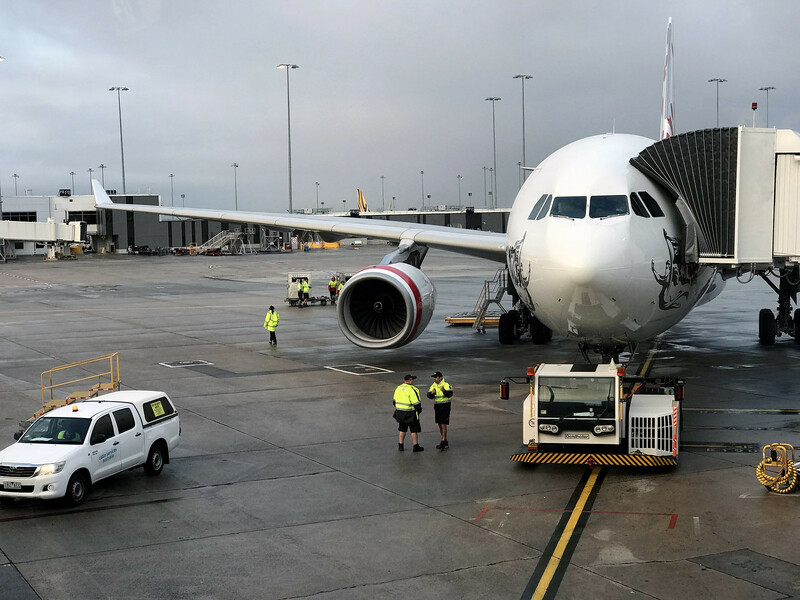 The sprawling open layout combined with the big windows gives an airy and spacious feel to the lounge unlike Virgin’s Sydney lounge. However, one minor issue during my visit was the understaffing of one of the coffee stations. Only one barista was working, and while he was very efficient there was still a fairly long line which would probably have been alleviated with a second person. It was nearly boarding time when I finished my coffee, as the lounge is before security, I headed to the checkpoint. 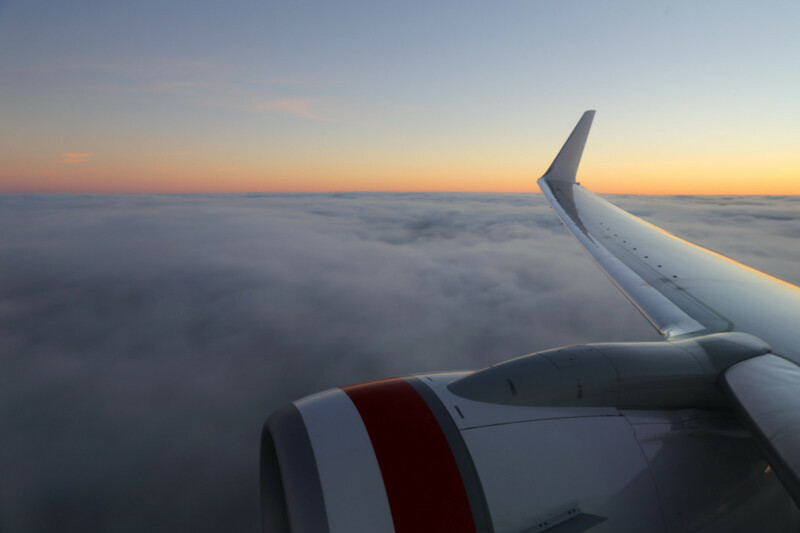 Virgin Australia’s Melbourne lounge features a premium exit, with two dedicated security lanes to clear security for passengers with lounge access. My aircraft was parked at the Gate 1, the closest gate to the lounge. Boarding was slightly delayed by about 10 mins but once boarding was called the priority lines were strictly enforced and the majority of passengers boarded according to the instructions. 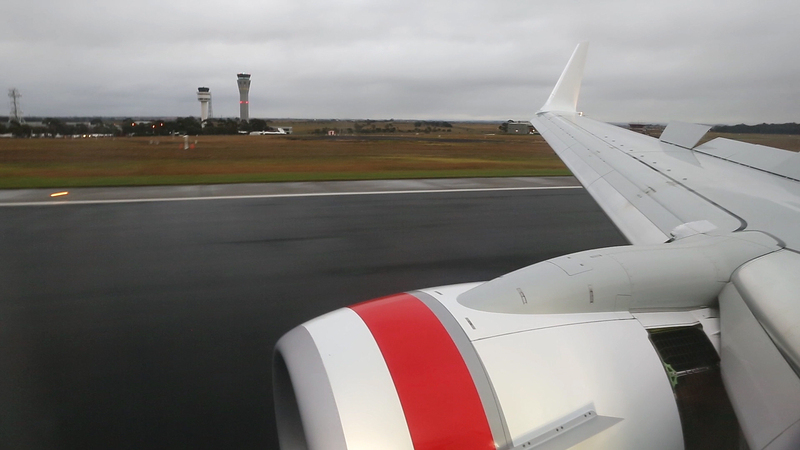 The aircraft taking me to Hobart was VH-VUU, an eight year old 737. We pushed back on time, with the flight being roughly 75% full. The seat next to me was thankfully empty whilst there was someone seated in the aisle seat. 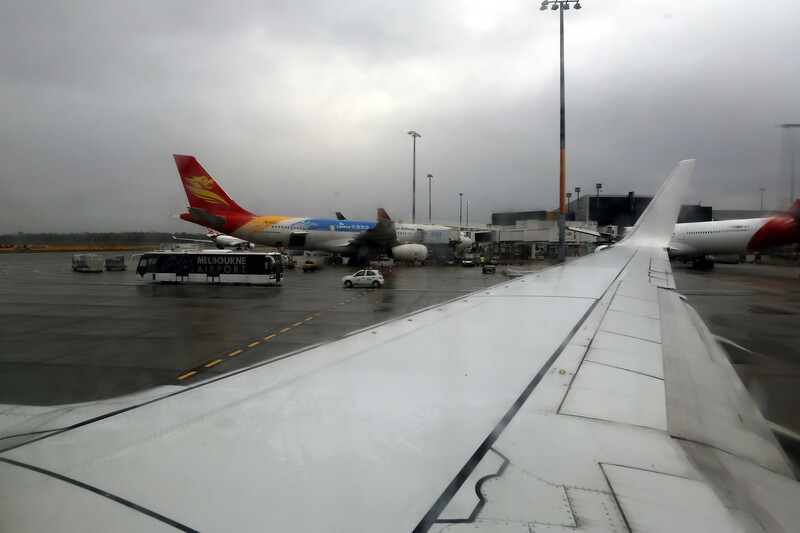 Rain had been falling periodically in Melbourne, obstructing most chances for photos whilst taxiing. 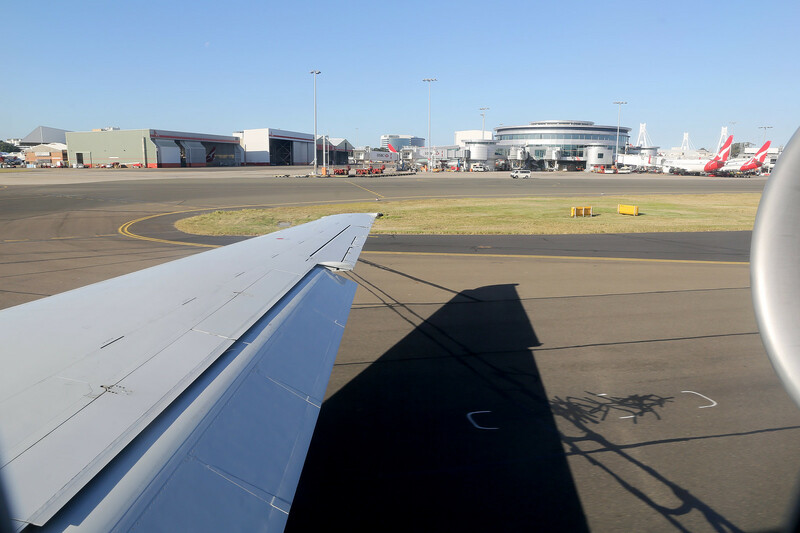 We proceeded to taxi out to Runway 27, the shorter of Melbourne’s two intersecting runways. 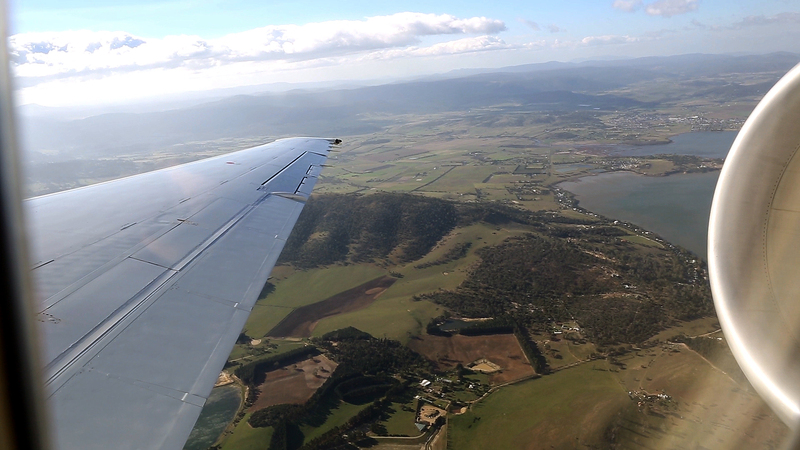 We departed to the west before turning south towards Hobart. Where the clouds were decreasing in density the further south we travelled. 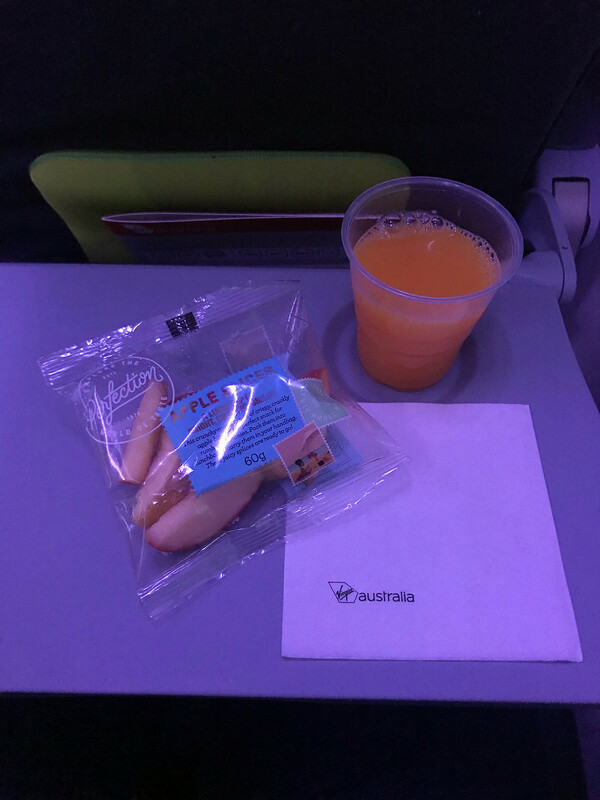 The “refreshment’ service commenced with the food offering a containing only protein balls, whilst the drinks had the typical choice of juice, tea, coffee, or water. Whilst the protein balls may have been a healthy option, it really wasn’t to my liking. Commencing our descent into Hobart the pilots updated the cabin with the weather, with strong winds and turbulence expected for our arrival. 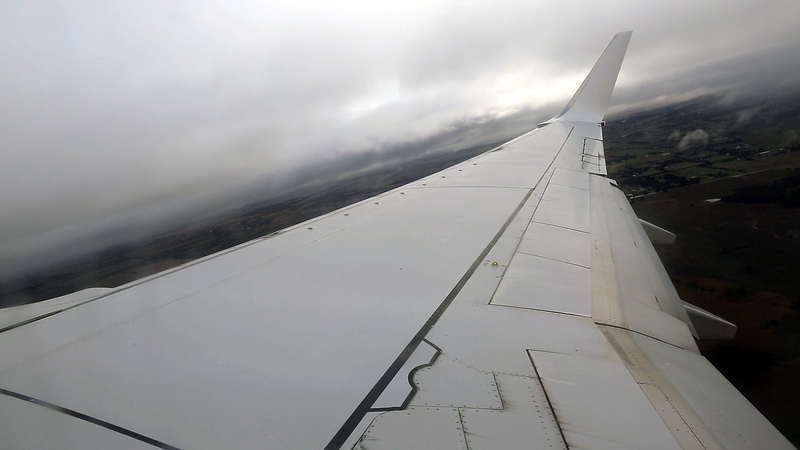 The approach and landing was fairly gusty as expected from the forecast. I really enjoyed the beautiful approach over the water and onto Runway 30 (St. Maarten style). We parked at the Gate 1 and de-planed with both the front and rear doors. Entering the terminal through the dedicated arrivals door near Gate 1. Passing though the door there is a bin to dispose of any good not permitted in Tasmania. This is due to strict biosecurity laws preventing unwanted bugs and pests from entering the island which can affect local agriculture and farming. The laws are enforced with an officer monitoring arriving passengers accompanied by a detector dog. Hobart’s terminal comparable to a glorified shed, a single floor with arrivals and departures split on either end of the building. I decided to find a nice spot to sit, relax, and complete an assignment. It was a quiet period at the airport and I was the only one clearing security. I decided to have a coffee at one of the two cafés airside. A mistake as the usual curse of overpriced and ghastly coffee struck again. Nevertheless, I had a couple of hours to complete my assignment on air traffic control management. 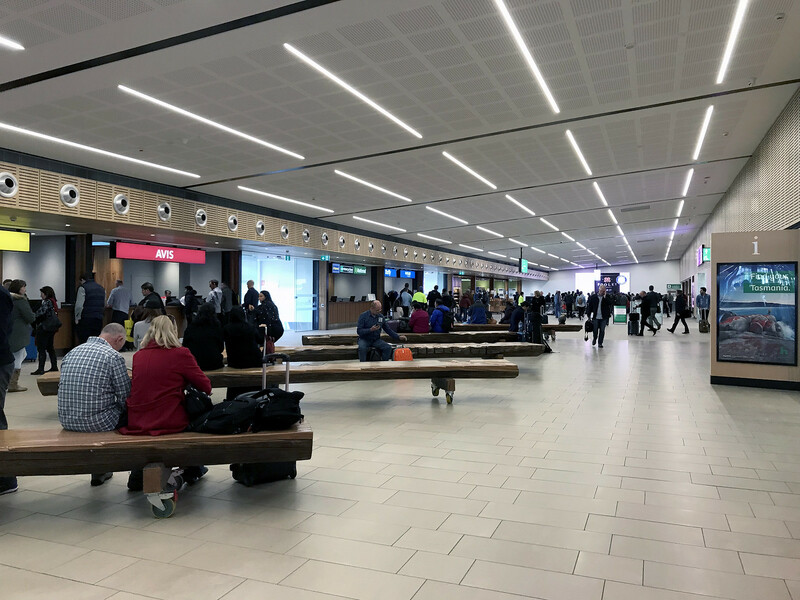 The nearly empty waiting area filled slowly as it neared the departure time for a couple of flights to Melbourne and Sydney. Before I knew it it was time for boarding. 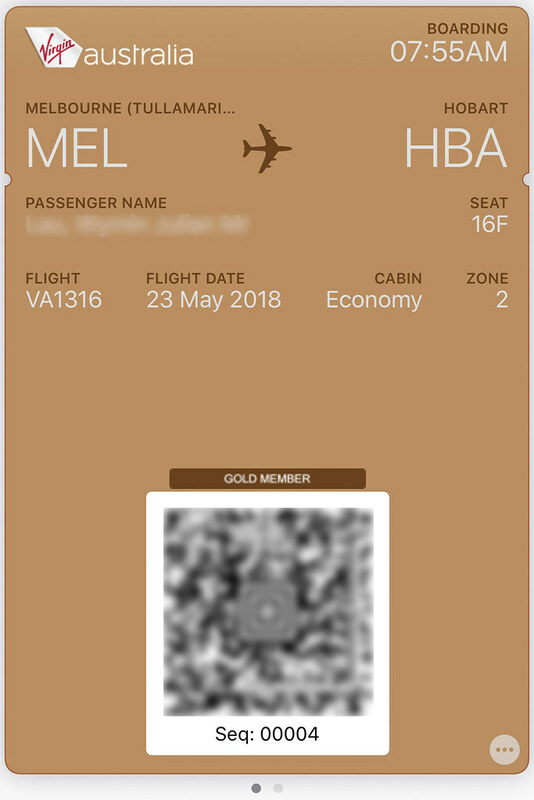 One comment on the Qantas boarding process, is that even while using a digital boarding pass the staff are required to issue a paper receipt which is used to double verify the seat number upon reaching the aircraft. My first ever 717 experience would be on board VH-YQY. 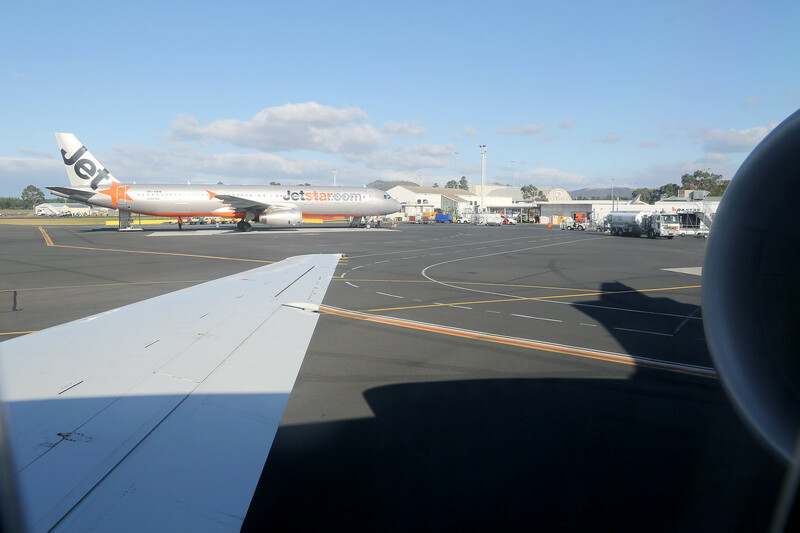 An 18 year old 717 which had previously flown with Olympic Airlines, Spaniard, and Blue1, before joining the Qantaslink fleet in 2016. 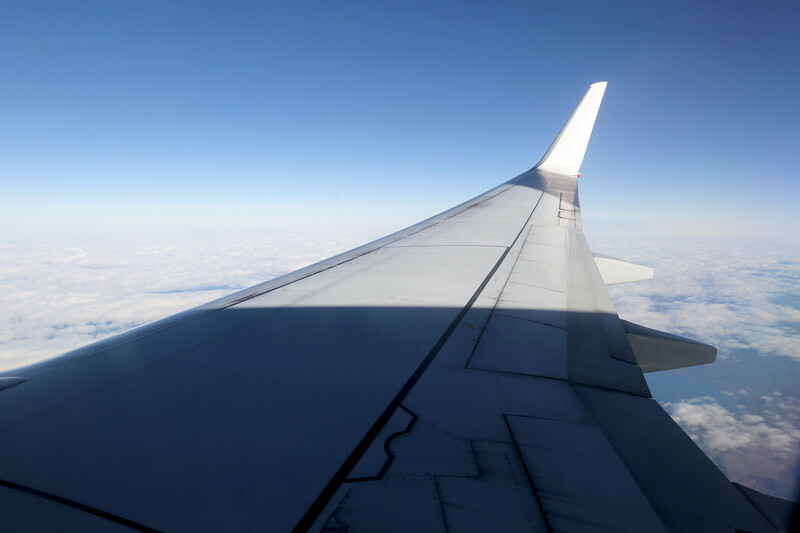 I felt that the seating position was very high compared to the wing. Which also looked incredibly short and very low to the ground. 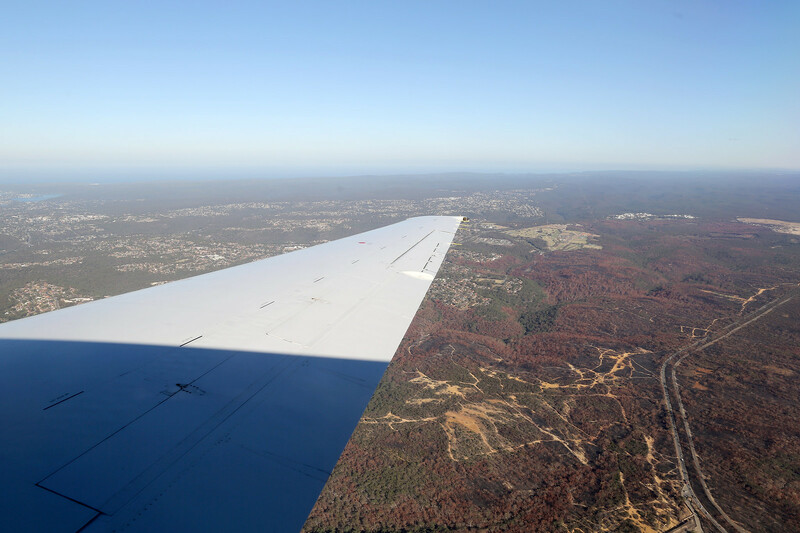 I could also see the engine and about half the fan blades from my seat, a fantastic feature of rear engine aircraft. The flight was almost full, mostly comprised of what I think were a Japanese tour group. 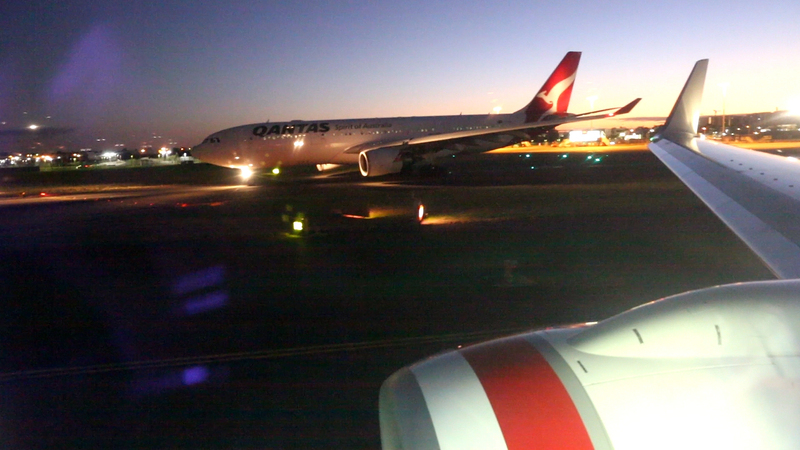 With the doors closed the engines were started and we turned out from the 45 degree stand, no pushback required. 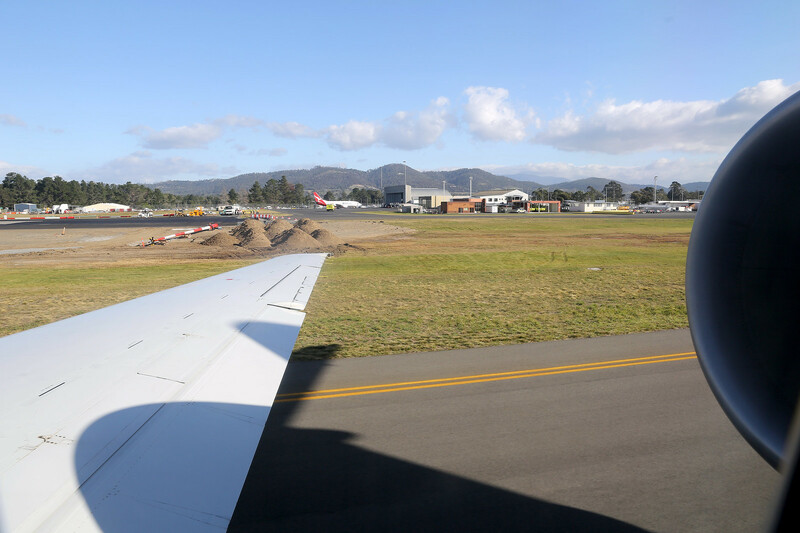 We entered the runway and backtracked as the taxiway doesn’t run the full length of the runway. Watch the video for the full experience. 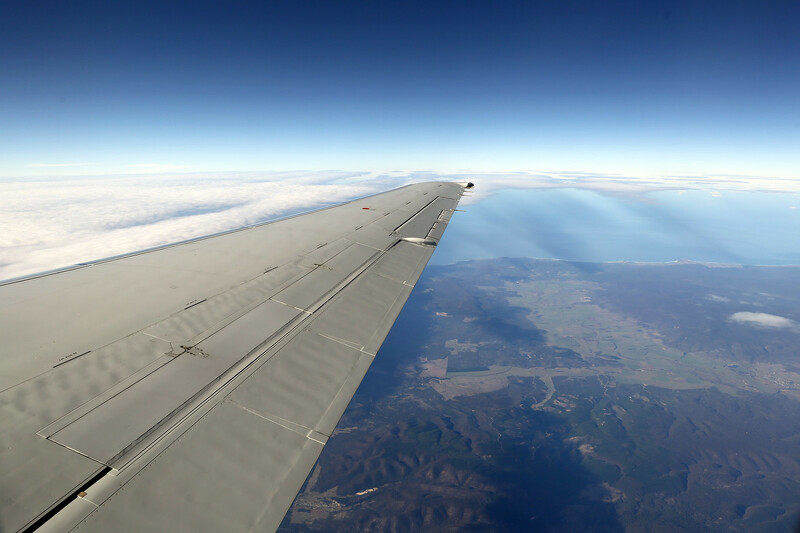 There were some few cumulus clouds on the departure, and the strong winds typical of these latitudes made it slightly bumpy. The refreshment service started, with an offering of a snack box plus water, juice, coffee, or tea. 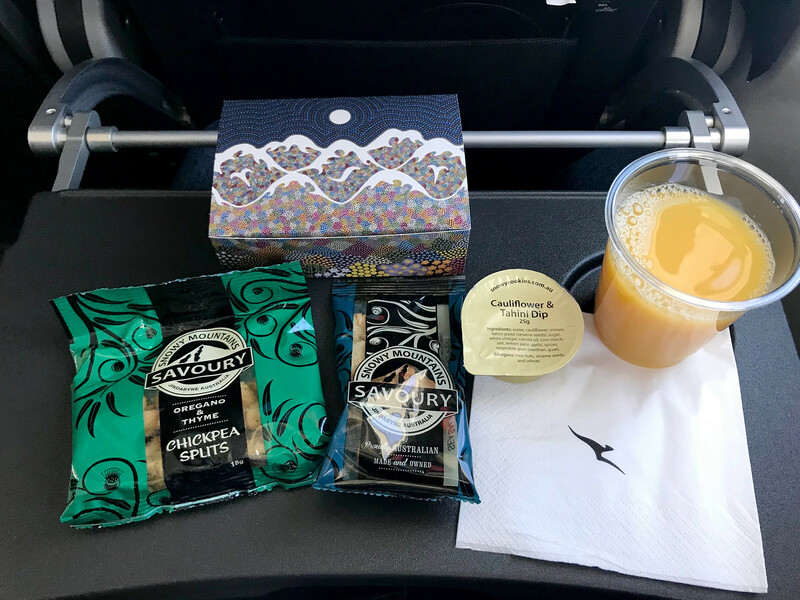 The snack box contained artisanal snacks from Snowy Mountains Cookies, Savoury and Snacks. Consisting of chickpea splits, crackers, and a cauliflower and tahini dip. Which the items are still a very light snack, its double what Virgin provides. 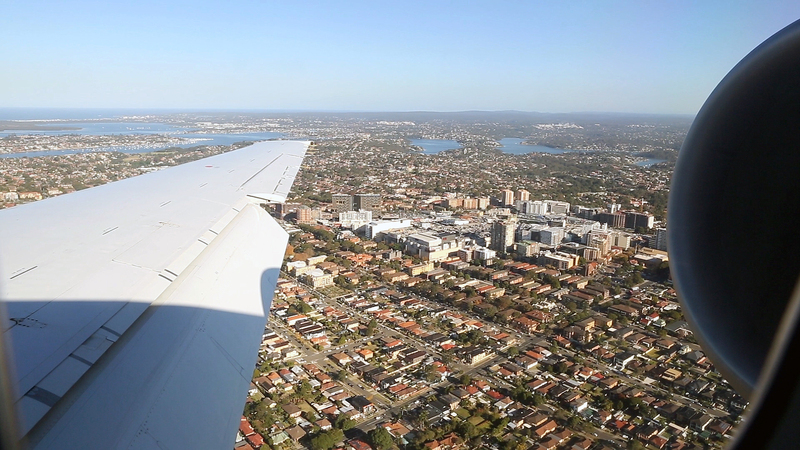 Just after overlying Canberra we started our descent into Sydney. I was expecting to arrive on one of the 16’s. 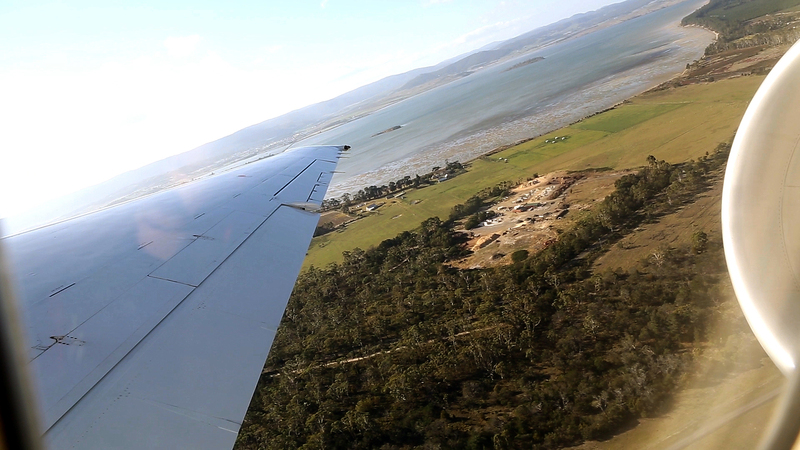 However, we seemed too low to overfly for Runway 16L, nor did we turn north for the downwind leg for Runway 16R. 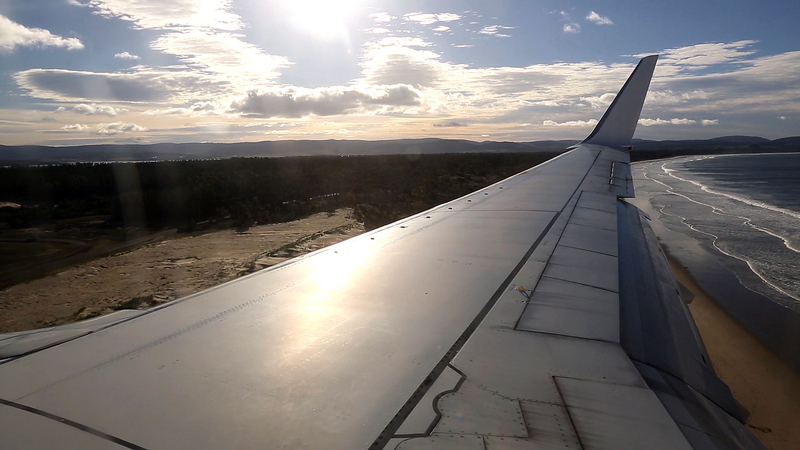 Then the flaps extended and I knew we were on approach for Runway 07. 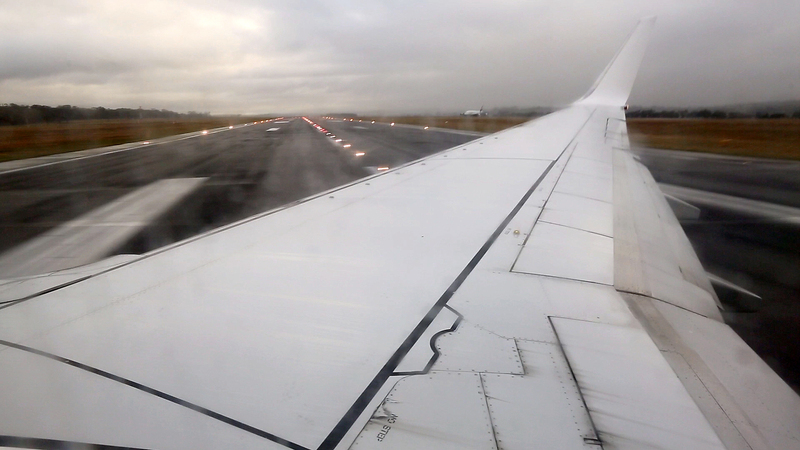 Making it only the second time I’ve ever landed on the cross runway at Sydney. 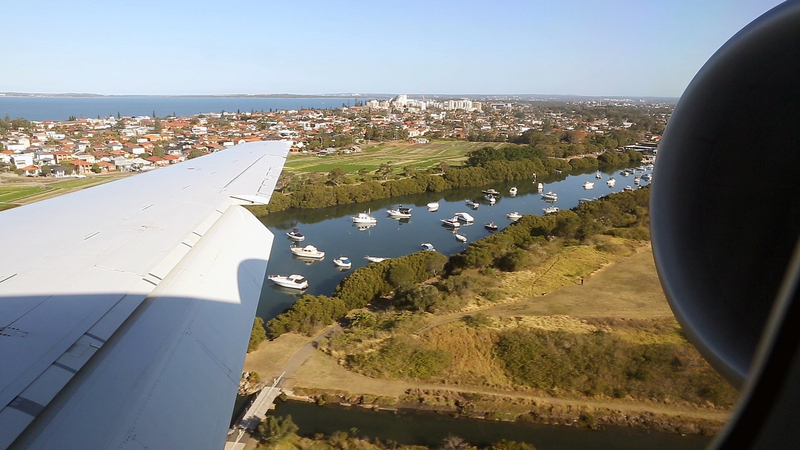 It was a welcome surprise with a nice change in scenery on approach, which can be enjoyed in full on the video. 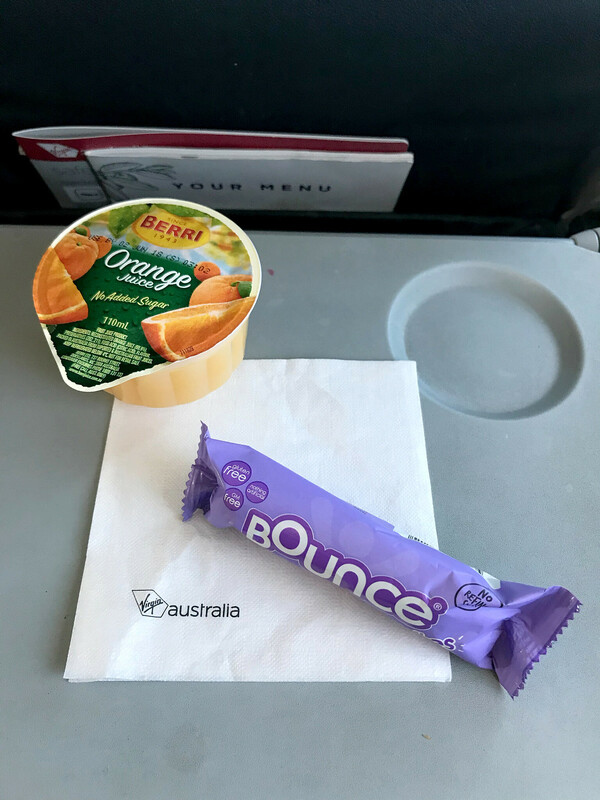 Virgin is almost a full service carrier, their inflight experience could be slightly improved, but if they continue to price themselves below Qantas they can definitely steal customers, especially with their highly competitive frequent flyer programme. 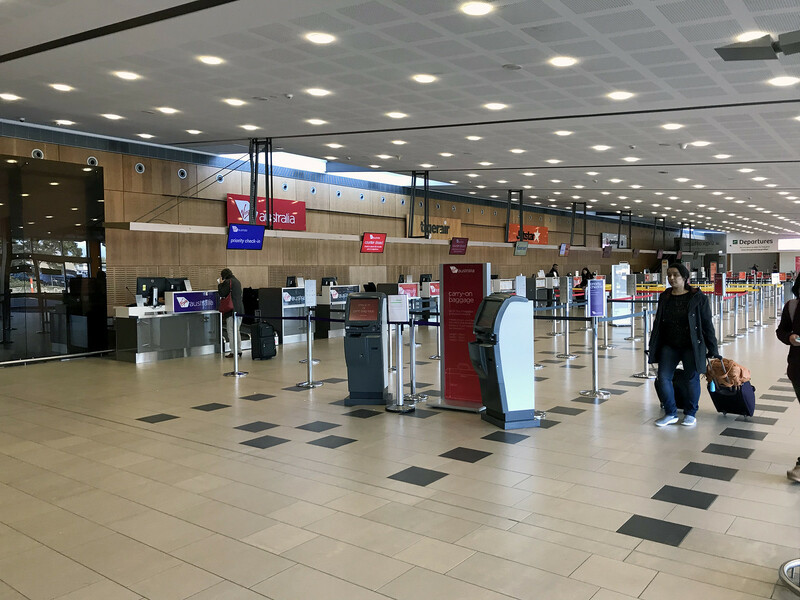 Hobart’s airport is adequate for the amount of traffic however Virgin should consider building a lounge, especially as they are launching flight from Hobart to Perth. 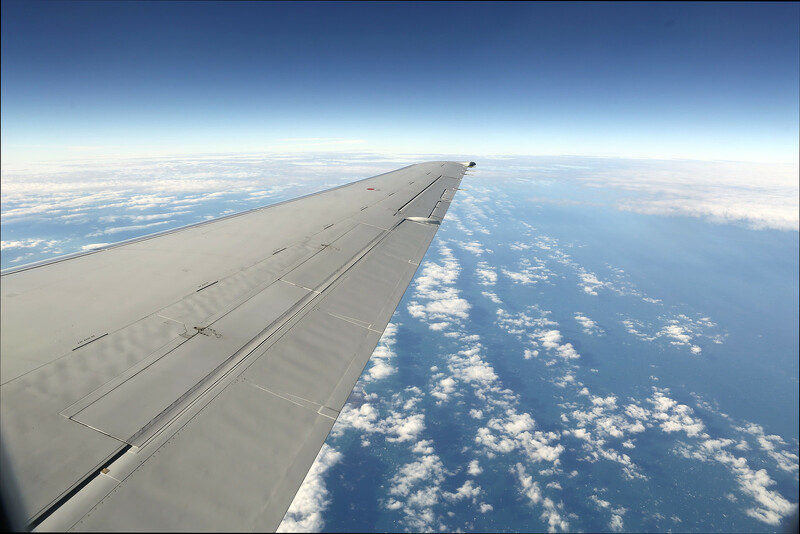 The 717 is a really nice aircraft and I would easily prefer it to a 737 or A320. 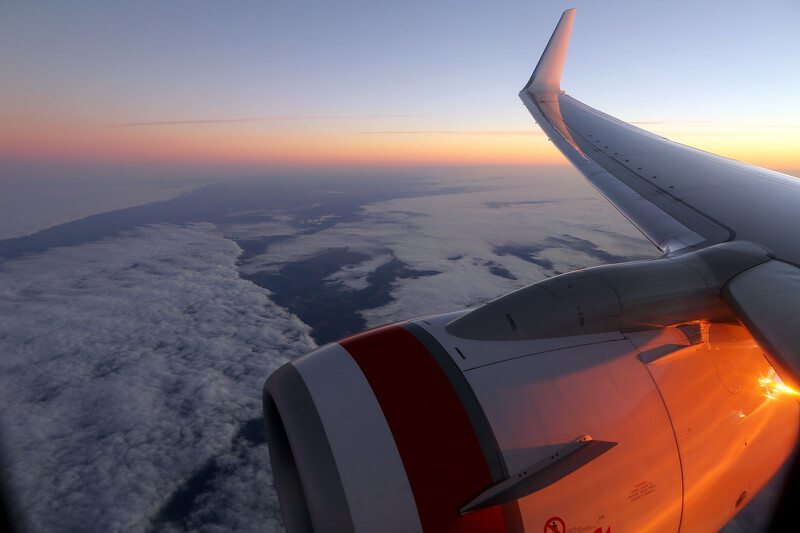 It adds some variety to the Australian skies and Qantaslink are only regional in name, offering everything to come to expect from Qantas mainline. 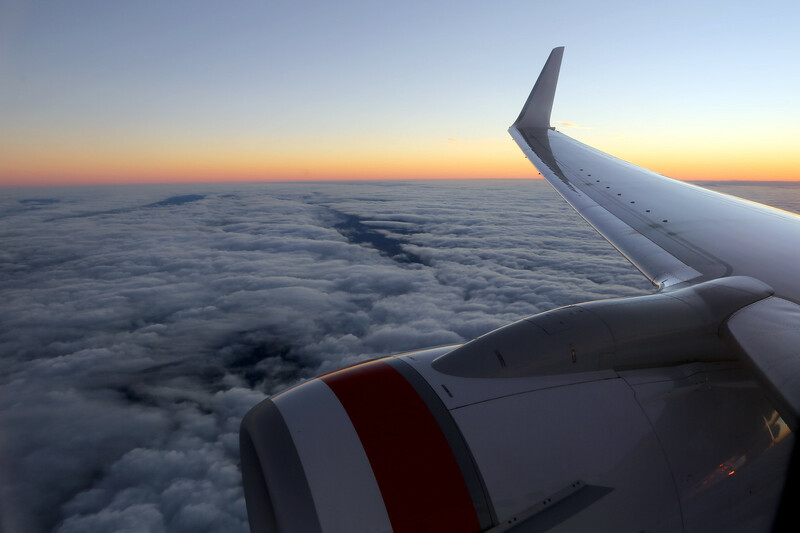 Flying domestically in Australia is generally a painless experience and choosing between either Virgin or Qantas is splitting hairs. 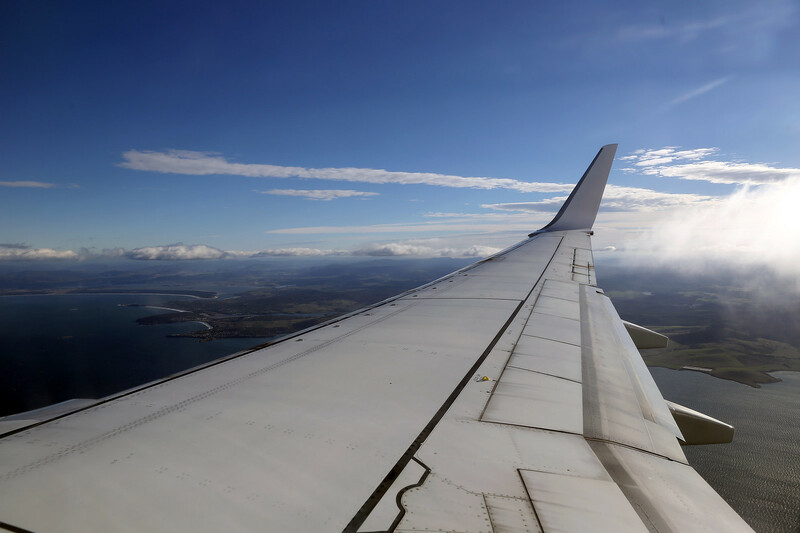 Personally it comes down to the aircraft they operate and any frequent flyer status held. Thanks for posting this review. Trips like yours are always fun when everything goes to plan or can be a nightmare if they don’t. Some very nice photos in your report. 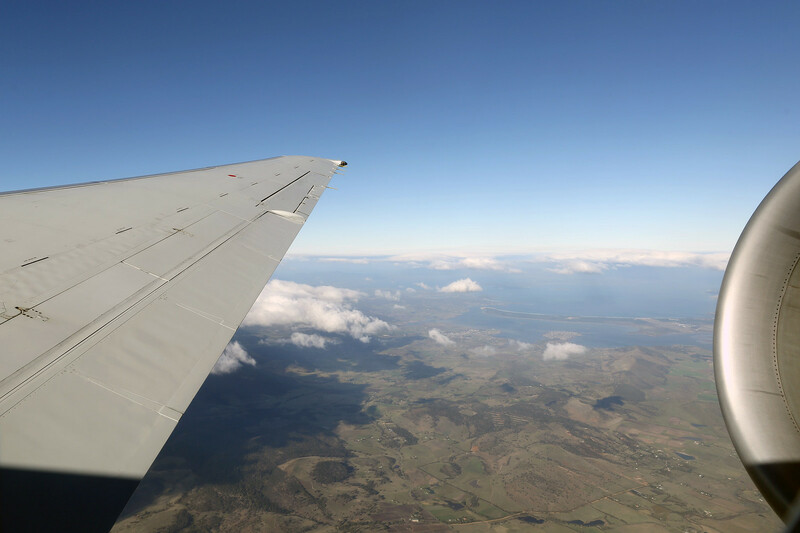 Two very scenic approaches, Sydney and Hobart (anywhere in Tasmania I should think!). Thanks for sharing this report with us. 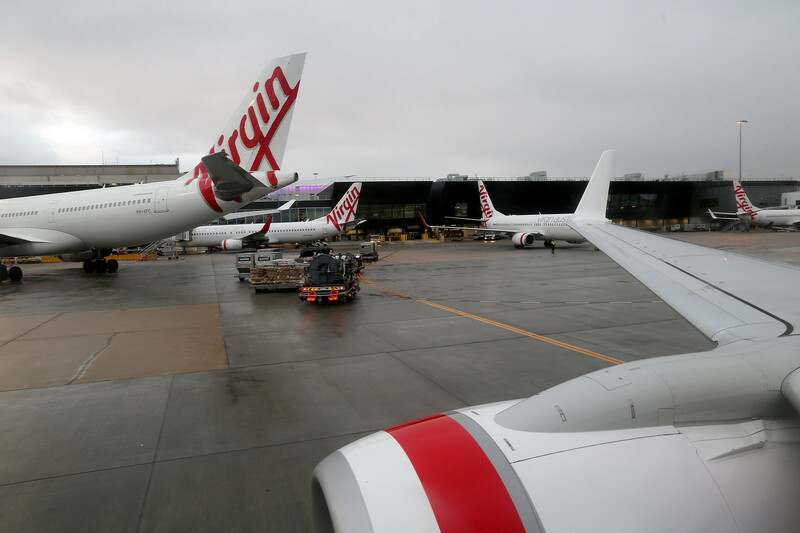 I remember reading several positive reviews of Virgin Australia in the past, but that was some years ago. 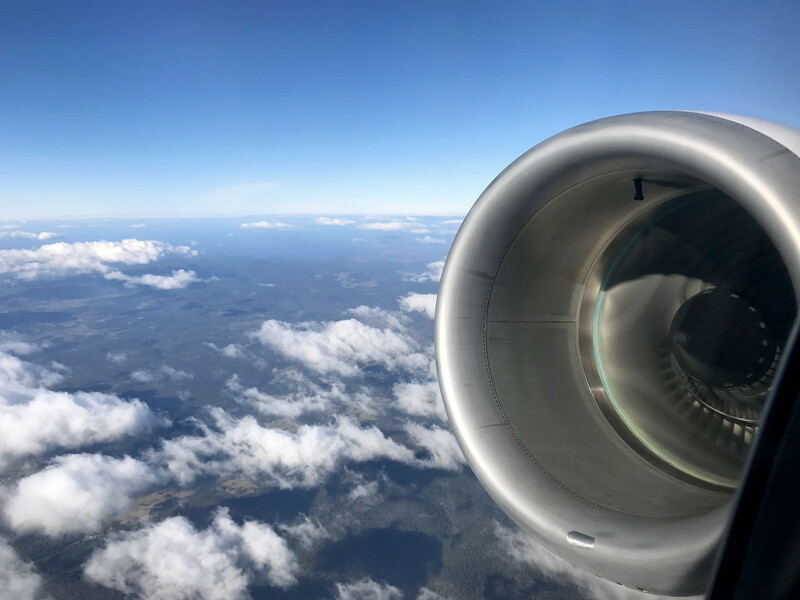 Always a delight to be on the B717 however - I love the sounds of the BR715 engines! Excellent report. VA's food offerings are a bit of a running joke between my mates and myself. Let's hope the new VA CEO brings in a bit of a culture change with the airline - at the moment it runs a very distant second to QF, and in fact JQ provides a more friendly/personable experience than VA these days. Hello! Thank you - I really enjoyed this report. Love your photo quality here too. What camera do you use? 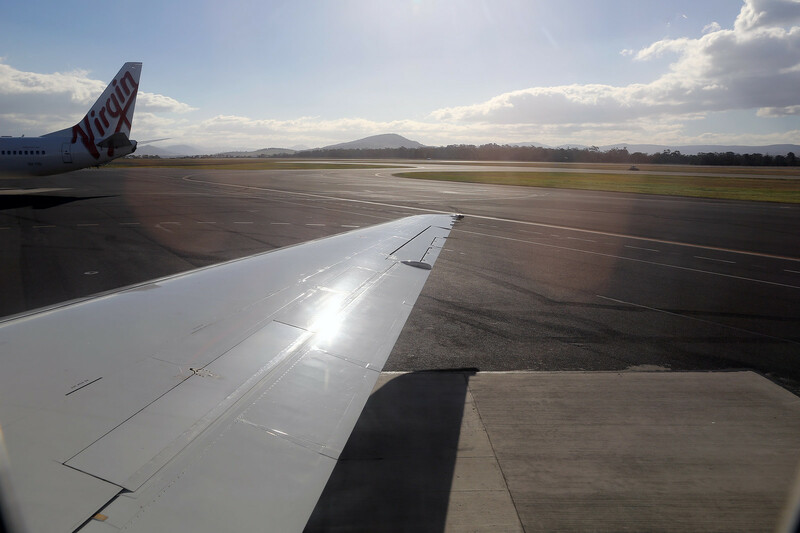 -YWD was at the Canberra Airport Open Day last year so I got to leisurely look through and around the then newest aircraft in the VA fleet. I was really impressed. I really like the colour scheme of the cabin, and especially the purple, and I never thought I would say that about an aircraft interior colour. Have yet to fly on their newest though. I really liked your approach and landing and departure photos at HBA. When I visited for the first time in 2018 the weather was not nearly as clear as this unfortunately. 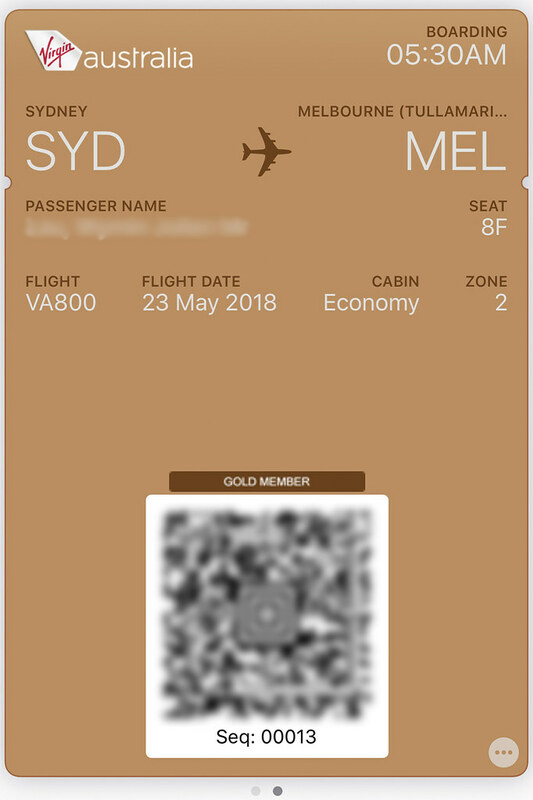 One comment on the Qantas boarding process, is that even while using a digital boarding pass the staff are required to issue a paper receipt which is used to double verify the seat number upon reaching the aircraft. 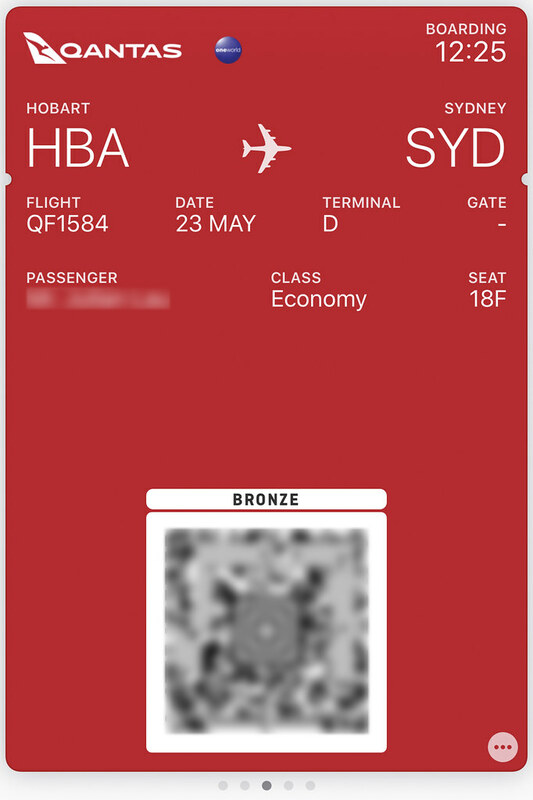 I noticed on my last flights in December that Qantas have stopped doing this now, and no longer issue the paper. 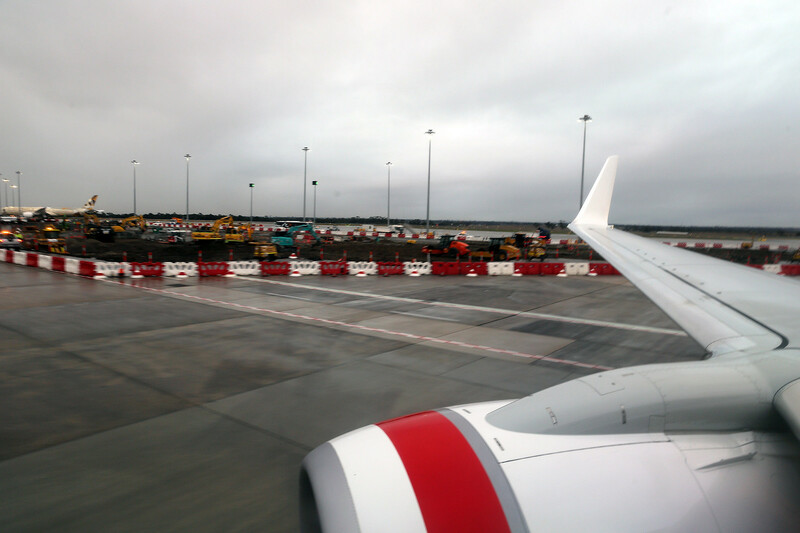 QantasLink are the best at this. 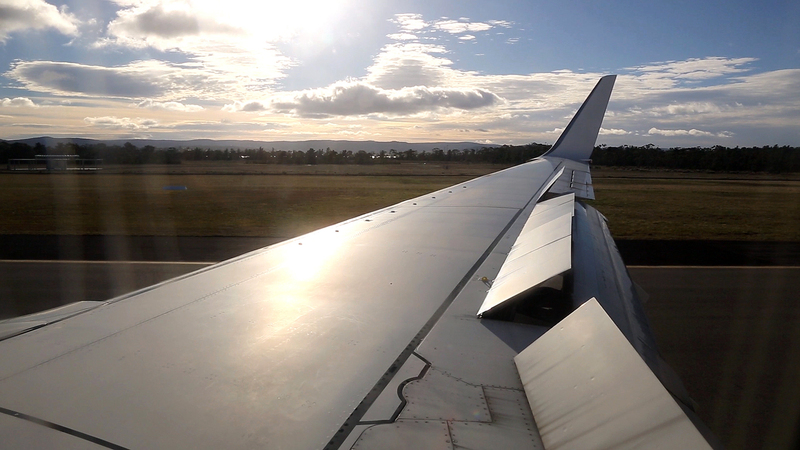 I like the 717 but not really sitting down the back, the middle or the front is way better, just for the noise factor. Nice, short evaluation at the end, and I agree with your comments. I used a Canon 5D mk III and an iPhone 7 Plus. I do like the 717s and definitely add some variation!